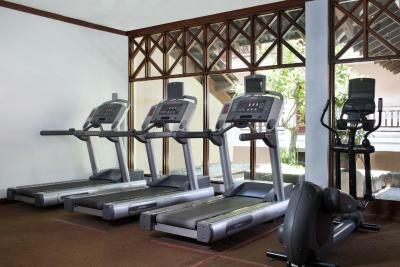 Lock in a great price for Sheraton Senggigi Beach Resort - rated 8.5 by recent guests. Staff are very good. Food is great and prices are reasonable. Every aspect of the hotel was phenomenal! The room was beautiful, the staff were wonderful, especially our host at breakfast - Hartono. Great location and the beach connected to the hotel was really beautiful. Want to go back to Lombok just to stay there again. The staff were AMAZING some of the friendliest staff I have ever encountered.... food at Senja is really good as well. Staff were helpful and friendly. Facilities and decor were good. Breakfast was a highlight with every type of food on offer. Beach/pool areas we great for relaxing. Prices for dinner were very reasonable. Highly recommended. There was a 50% off deal for the spa which I used. Great deal, would not have done it otherwise. Also breakfast was fantastic and the pool awesome. Also liked the happy hour deal. The Sheraton was fantastic; service impeccable; the buffet breakfast the best ever. Relaxing on a daybed by the pool priceless. Nice room with garden view. Very nice breakfast. Quiet. 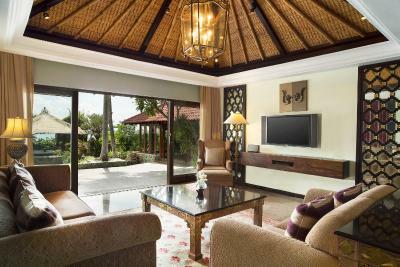 One of our top picks in Senggigi .Situated right on Lombok’s Senggigi Beach, Sheraton is surrounded by tropical gardens. It houses 4 dining options, an outdoor pool and a spa. Modern rooms offer a terrace or balcony featuring ocean, pool or garden views. 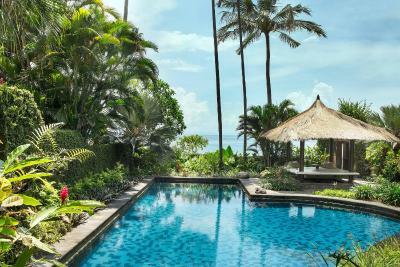 Sheraton Senggigi Beach Resort is 1.2 miles from Batu Bolong Temple and 7.5 miles from Lembar Harbour, which connects Lombok to Bali. Lombok International Airport is 31.1 miles away. 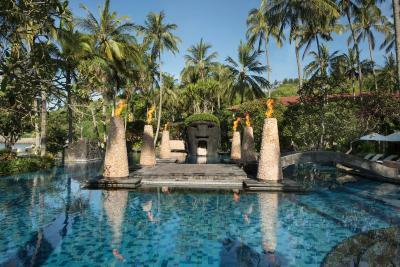 Putri Duyung Bar is a sunken pool bar where guests can order snacks and drinks, while Bawang Putih Grill offers grilled steak and seafood dishes by the poolside. 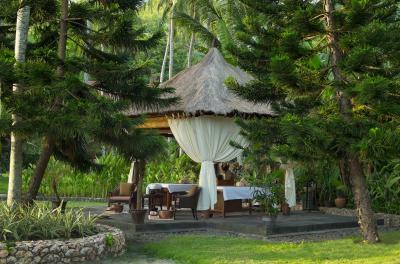 Facing the garden, Kebun Anggrek Restaurant serves breakfast. Drinks and light snacks are offered at Sunset Bar. 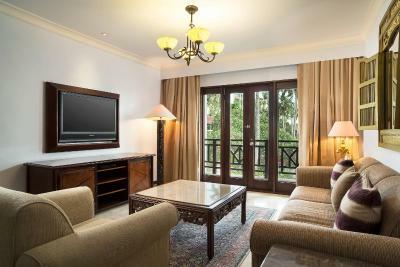 Spacious air-conditioned rooms at Sheraton Senggigi feature a flat-screen TV with a DVD player and a personal safe. 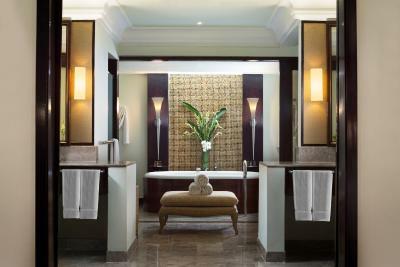 Private bathrooms come with bath and shower facilities. 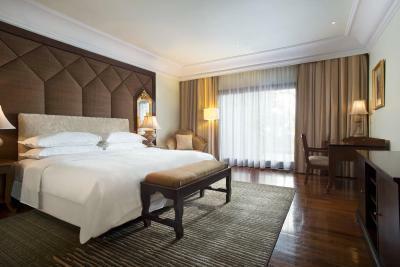 Tea/coffee making facilities and a minibar are included and 24-hour room service is provided. 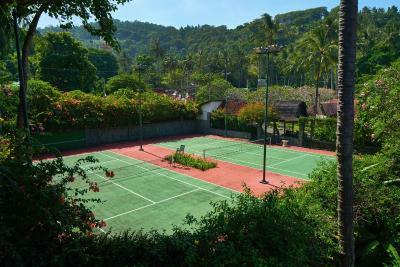 Guests can play a game of tennis, or exercise in the gym. Other facilities include a business centre offering free internet access, and a tour desk. Staff at the 24-hour front desk can assist with luggage storage, currency exchange or airport shuttle services. Complimentary parking is provided. 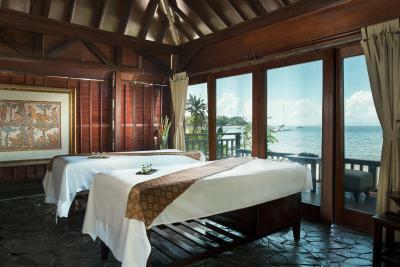 This is our guests' favourite part of Senggigi , according to independent reviews. 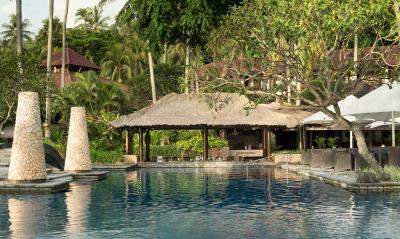 Sheraton Senggigi Beach Resort has been welcoming Booking.com guests since 29 Mar 2012. 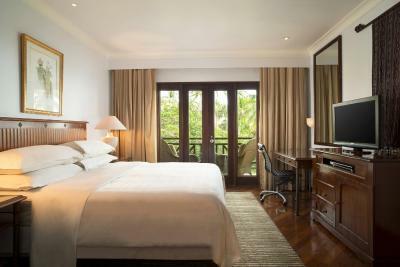 When would you like to stay at Sheraton Senggigi Beach Resort? 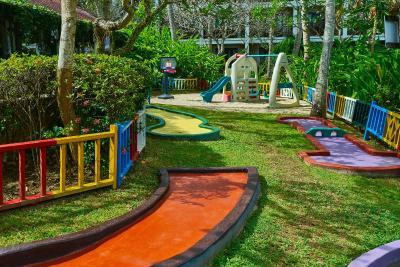 House rules Sheraton Senggigi Beach Resort takes special requests - add in the next step! 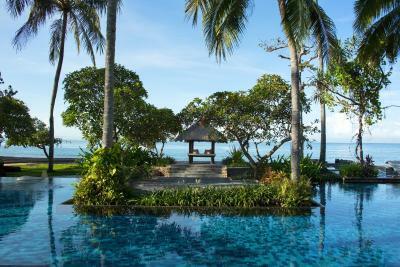 Sheraton Senggigi Beach Resort accepts these cards and reserves the right to temporarily hold an amount prior to arrival. Beach is not clear. Rubbish gets blown in (and picked up in the morning but not enticing for swimming) which is ok because of the great pool. People heckle to sell u sarongs and beads non stop on the beach but understand that everyone is trying to make a buck post earthquake. Unfortch some just don't take no for an answer even if u bought from them the day prior. Bathrooms are tired, need regrouting. The staff were exceptional. 5 star service. Great pool for kids. They loved snorkelling around it. Very safe and secure. Can hire trad style boats from just in front of hotel for snorkelling daytrips to the gilis. Takes about 45mins to get there. 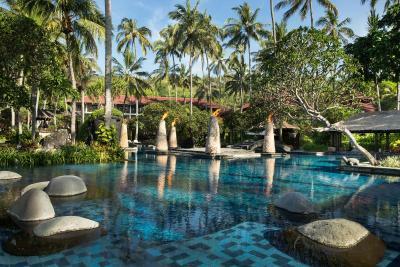 Seriously great value hotel and good to support Lombok. Everything, especially the staff. Everyone is very nice. I would come back. 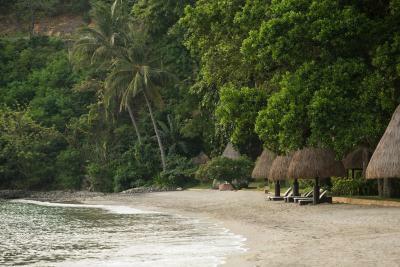 Private beach with security. Showers need a good clean to remove mould. Rubbish floating in the sea was a disappointment. Fake advertising as it doesn't look as it looks in the pics and over priced. Bit too much service at breakfast. Too many staff clearing plates when we were not ready, felt a little rushed.